As you can tell this issue show what happens on a romantic getaway on Barsoom. Only with with bloodthirsty creatures trying to kill you. A stand-alone tale after the epic six-issue "Invaders of Mars" tale, "Excursion" is a fun tale that provides a nice breather between tales. In a recent interview Ron Marz related that he wanted to do single or two-issue tales and I for one embrace that since it can grow wearying keeping up with multi-issue tales. 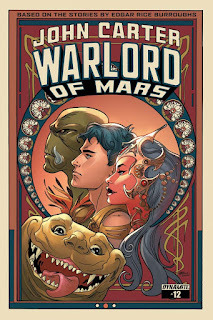 Here Marz does a nice balancing act of setting up a potential new storyline (Carter expressing concern about Barsoom's future) while giving us a nice short story that delivers a quick snappy read. Handling the art duties this time is Ariel Medel, who brings a good style to the characters and creatures, as well as the action sequences later on. Some will miss Abhishek Malsuni's work-which was really growing on me-but Medel does keep balance with the series and the designs established. A nice change after the epic stories of past Barsoomian comics, "Excursion" gets a solid rating here folks. Until next time faithful readers.